A precious stone mentioned in Gen. ii. 12 by the side of gold and the "shoham" stone as one of the chief products of Havilah. Since manna is compared in appearance to Bdellium (Num. xi. 7), it may be concluded that the latter was generally known among the Hebrews, and was considered very precious. The meaning of the word is not quite certain. 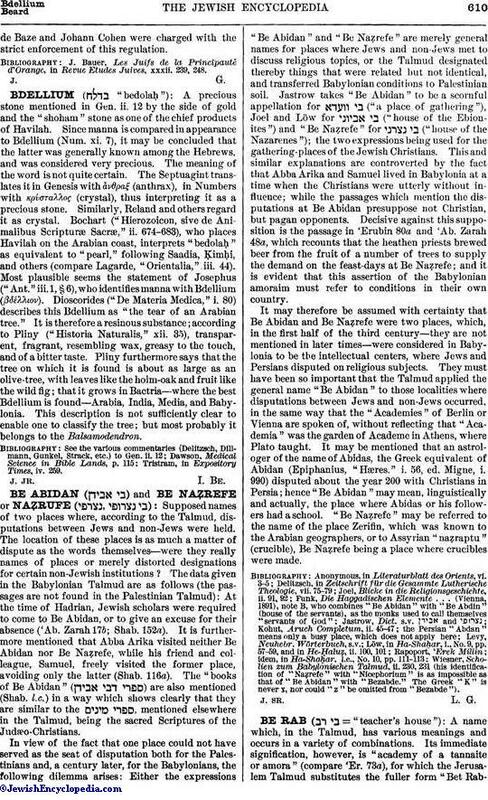 The Septuagint translates it in Genesis with ἄνθραζ (anthrax), in Numbers with κρύσταλλος (crystal), thus interpreting it as a precious stone. Similarly, Reland and others regard it as crystal. Bochart ("Hierozoicon, sive de Animalibus Scripturæ Sacræ," ii. 674-683), who places Havilah on the Arabian coast, interprets "bedolaḥ" as equivalent to "pearl," following Saadia, Ḳimḥi, and others (compare Lagarde, "Orientalia, iii. 44). Most plausible seems the statement of Josephus ("Ant." iii. 1, § 6), who identifies manna with Bdellium (βδέλλιον). Dioscorides ("De Materia Medica," i. 80) describes this Bdellium as "the tear of an Arabian tree." It is therefore a resinous substance; according to Pliny ("Historia Naturalis," xii. 35), transparent, fragrant, resembling wax, greasy to the touch, and of a bitter taste. Pliny furthermore says that the tree on which it is found is about as large as an olive-tree, with leaves like the holm-oak and fruit like the wild fig; that it grows in Bactria—where the best Bdellium is found—Arabia, India, Media, and Babylonia. This description is not sufficiently clear to enable one to classify the tree; but most probably it belongs to the Balsamodendron. Tristram, in Expository Times, iv. 259.